Páca de thrí sheit aibítir mhaighnéadach, le rogha dathanna. Seol rphost le do roghanna (trí uimhir ón liosta thuas) chuig: rogha@cluiche.ie nuair atá tú ag déanamh d’ordú. Pack of three magnetic alphabets with a choice of colours. 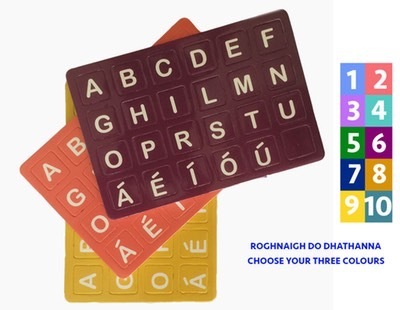 Email to rogha@cluiche.ie with your colour preferences 1-10 from the above choices when placing your order.